I bake a lot of my own bread and think that it might be what I enjoy baking the most, but I am quite fussy about what I make, I don’t tend to make much in the way of plain loaves of bread, when I bake I want it to be interesting and flavourful. 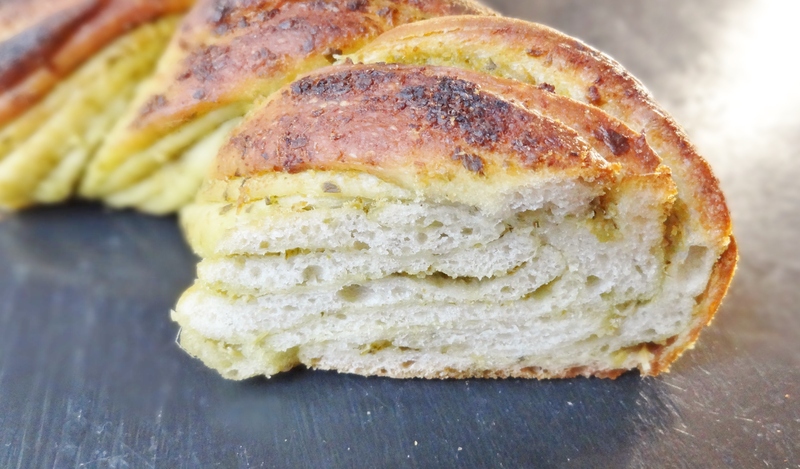 Well this bread is most definitely flavourful, soft white bread is layered with multiple layers of pesto meaning that every bite is full of flavour. It looks impressive and complicated but is actually very simple to make. 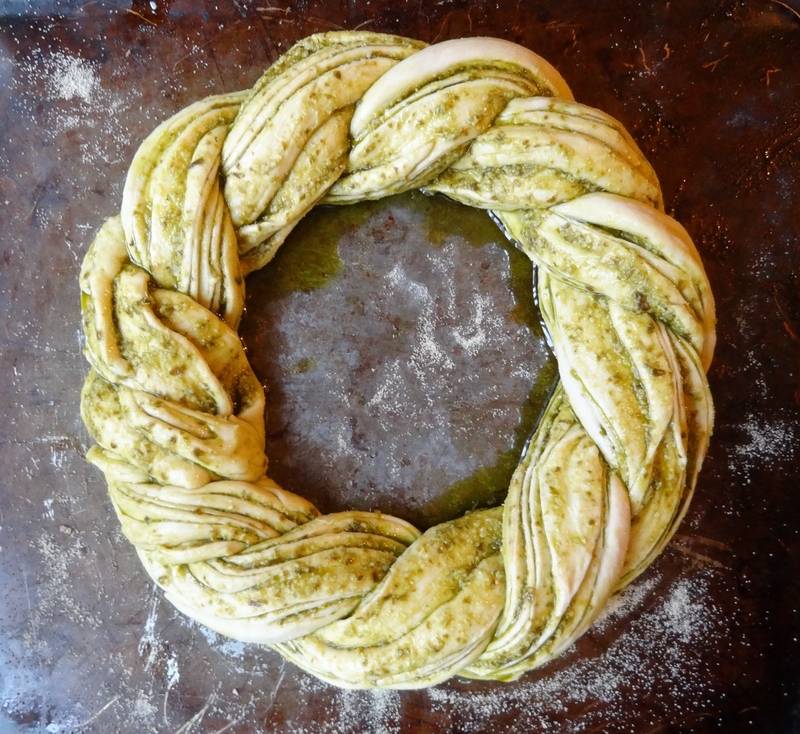 The bread dough is rolled out into a rectangle and spread with pesto, you then roll it up like a swiss roll, cut it in half lengthways and twist the two halves together with the cut edges facing up (this is what makes the lovely pattern), then you make the twist into a wreath shape and you’re done! All of the thin cut edges go golden brown and crispy in the oven, while the inside of the loaf is lovely and soft. It also pulls apart easily which makes it great for ripping bits off to dunk in soup, which is how I like to serve it, but it would also be great as part of a picnic or buffet. This is a great method of making an impressive looking loaf of bread and you can use whatever you like for the filling. 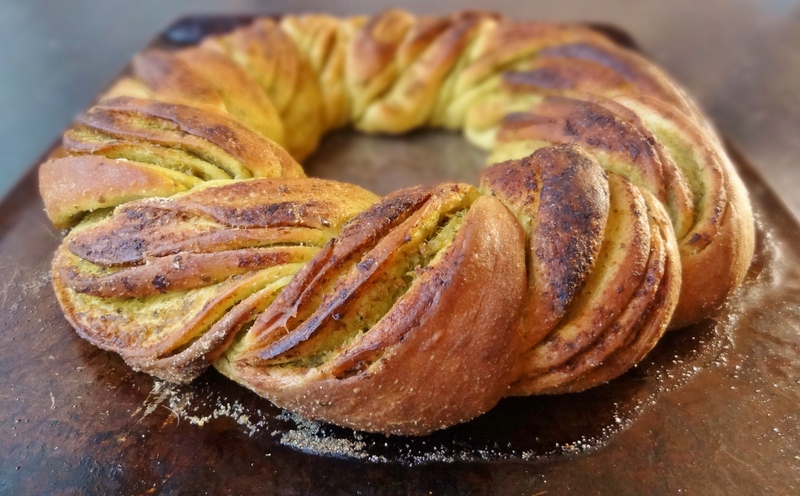 I make this bread a lot and have tried substituting red pesto for the green and also replacing the pesto with Boursin cheese which was delicious! 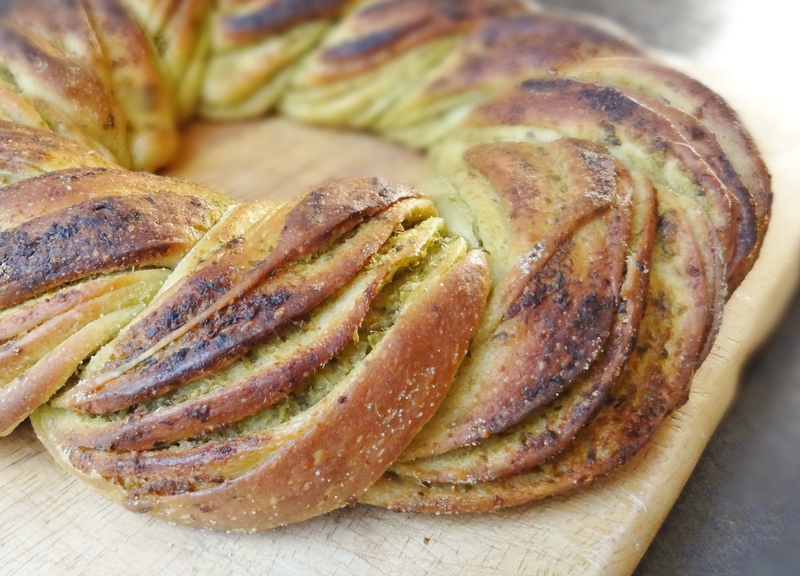 If you wanted to make cheesy pesto bread you could grate some parmesan over the pesto before you roll the dough up. I’m sharing this bread at Fiesta Friday this week! Place the flour in a large bowl, add the yeast to one side and the salt and sugar to the other (if salt comes into direct contact with the yeast it can kill it). Pour in the olive oil and two thirds of the water, mix together to make a shaggy dough. Add more water gradually until it all comes together into a slightly sticky, but not wet, dough. You may not need to add all of the water or you may need a little more. Turn out onto an un-floured surface and knead for 5-10 minutes until smooth and elastic. You can spread a little olive oil on the surface if you find the dough is sticking too much but try to avoid the temptation to add extra flour, the dough does become less sticky as you knead. Place the ball of dough into a lightly oiled bowl and cover, leave to rise until doubled in size, at least 1 hour. Once the dough is risen, knock it back then roll it out on a lightly floured surface into a rectangle approx. 30x45cm. 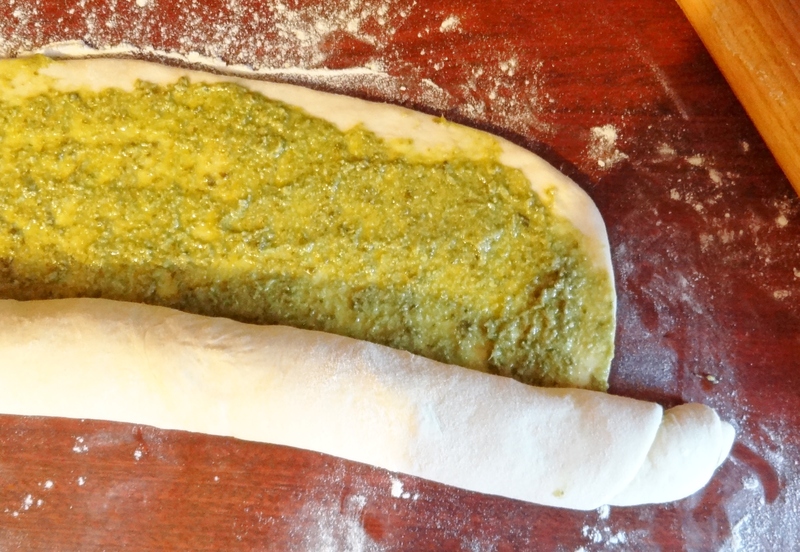 Spread the pesto evenly all over the dough. Starting at the long edge closest to you, roll the dough up tightly but gently, like a swiss roll, into a log. Line a baking sheet with baking parchment or sprinkle it with semolina, transfer the roll of dough to the baking sheet and, using a sharp knife or bench scraper, cut the roll in half lengthwise. 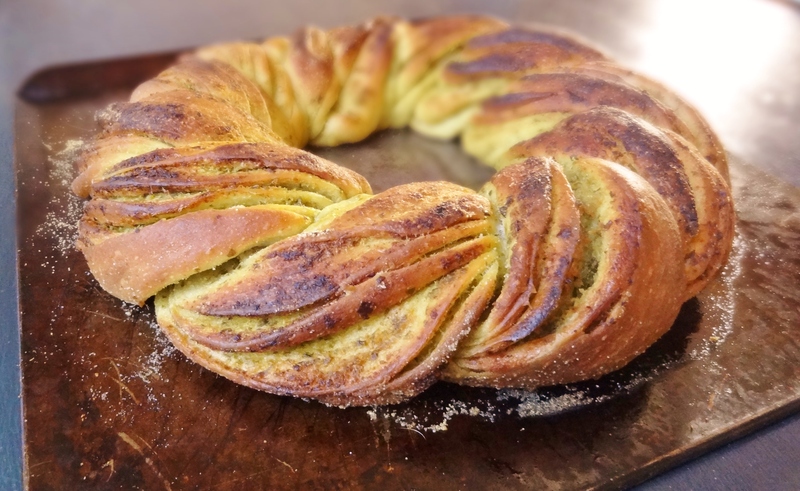 Turn the two halves so that the cut side is facing up then lay one over the other so that they make an X shape, twist them together by laying one side over the other, keeping the cut side up, until all of the dough is twisted and you are left with a braid. Loop the braid round into a wreath shape and pinch the ends together. Loosely cover and leave to rise for about 45 minutes until puffy and increased in size and the dough springs back if you gently press it with a finger. Meanwhile, preheat the oven to 220°C/425°F/gas mark 7. 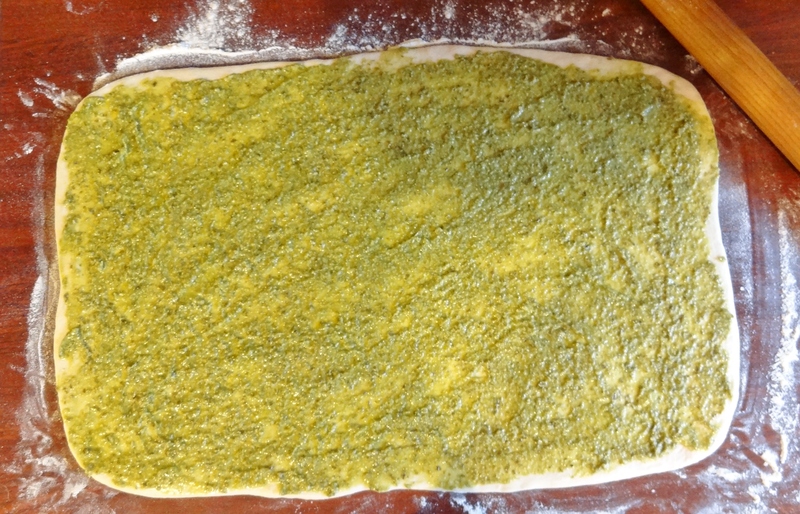 You may find that while the dough is rising you get lots of oil from the pesto puddling on the baking sheet, if this happens, gently blot it up with some kitchen roll. When the dough has proved, place in the centre of the oven and bake for 25-30 minutes until golden brown and baked through. If it starts to colour too quickly, cover loosely with some tin foil. Once baked transfer to a wire rack to cool. 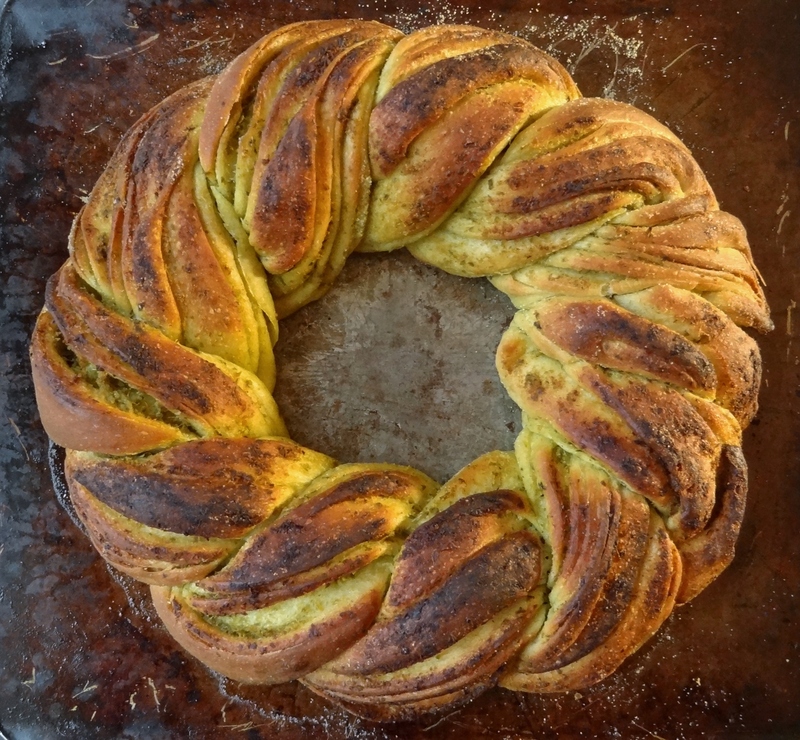 Wow – that looks amazing and how nice to see a pesto version! Great job!! I imagine that smell delicious and tempting is this bread. I love baking bread too. This is a masterpiece that I definitely want to try! This is beautiful! I’m sure it’s delicious! this looks so good, I love the design of the bread, very creative! Looks beautiful! Pesto is a great idea too! Great blog! How very creative of you. Thank you so much for bringing this to FF. I love making bread and haven’t been doing it for a while….you make me want to jump back into it! Thanks for bringing it to the party!